Goods: Iron and copper, down and feathers, quartz and blood quartz as well as making featherbeds and pillows. Resources: Foodstuffs, fish, waterfowl, some timber. Lands: Interior lowlands with some forest, large lake (Denas Lake) which the seat is on the banks of, rivers, minimal highlands. Climate: Short, cool summers and long, chilly but mostly mild winters (snow but rarely storms). 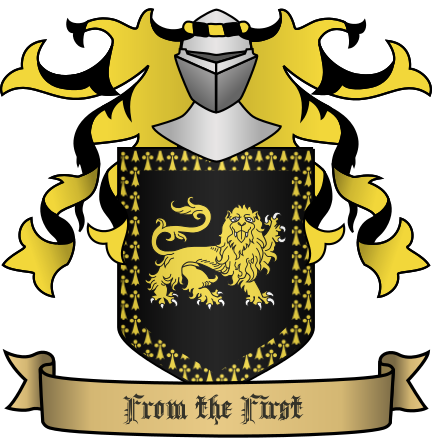 A noble and warlike house claiming decent from Julian Castor and more recently Sir Julian t'Juliano, who won several victories against the Kherzari hordes in Couviere's early years and was an early rival to the l'Valdan for the kingship of Couviere. Settled now into the role of vassal the t'Juliano have distinguished themselves as aggressive defenders of Couviere's borders with Tiria and just as aggressive in pursuing their ambitions at court. Settlements: The township of Julian's Hold is the major center for the region, with other towns and villages being scattered across the county. Fortifications: Julian's Hold is the family's main seat. A strong castle built to withstand long sieges. Troop Numbers: The t'Juliano are required by their liege lords to maintain 500 fighting men. However being a military minded house they maintain 700 troops including their own Lionhearts. The Lionhearts: A fighting force of men-at-arms on foot trained and organized in the style of the Etharian Legions. Their current fighting strength is one full century of men-at-arms on foot supported by a half-century of 50 knights on horseback and 25 scouts. Marco t’Juliano 1842, former page and squire at court crippled in a riding accident. Religion: The house is nominally worshipers of the One Faith but they tend to only pay the Faith lip service for the sake of their people. Their views tend to be much more agnostic and on occasion leaning towards heretical with an interest in the Eastern Church. Nobles: House t'Juliano is very aware of it's good blood and Imperial roots. The members of the house are taught the value of loyalty to family and positive ambition (ambition for the house as a whole rather than simply indulging one's own desires) as well as the primacy of the head of house in all affairs. A border house, members are expected to learn at least some combat skills and the heads of the house spend time fighting with the Lionhearts to hone their skills and bind the house's most potent military men to them. Those who cannot keep up with the training can find themselves passed over for inheritance in favor of a more able kinsman or kinswomen. Inheritance: Eldest child so long as the eldest child is able to fufill the roles of the head of house. If not then it passes to the next child and so on until a suitable member of the house is found. Commoners: The common people of Juliana are generally well-cared for but live in fear of Tirian invasions. They tend to be a cautious lot by nature and most of them have some martial skills that could be applied to the defense of their village or town. The t'Juliano tend to be picky about who they wed their family members to (after all they're gifting them the blood of Julian Castor after all!) and tend to only wed into houses of old blood and a martial tradition. t'Juliano weddings tend to be lavish affairs and celebrated with a tourney in keeping with the old custom a tribute of courage and valor will draw the One's eye and bless the marriage.